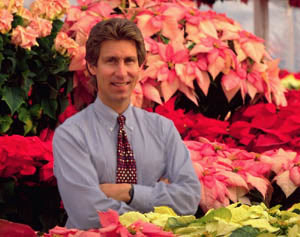 It has become an American Christmas tradition of decorating homes and offices with poinsettias. The beautiful green and red leaf shrub is commonly sold at variety stores including drugstores, hardware stores and supermarkets. Had it not been for an American Ambassador to Mexico, the shrubs given as gifts to office coworkers, families and friends may have never been. Called “Cuetlaxochitl” (quet-la-so-chill) by the Aztecs, poinsettias bloomed wildly each December in the lower lands of what is now central Mexico. The shrub was harvested for Aztec royalty where the sap was used to control fevers among the ill and the red leaves were used to make red dye. In the 1820s, Joel Roberts Poinsett was American Ambassador to Mexico under President John Quincy Adams. On a December trip to Mexico City, which was once the Aztec capital, he noticed the red flowered shrub decorating a nativity scene in a Taxco church. Being a botanist, he had plants and cuttings sent back to his green house in South Carolina. It was there where William Prescott, a historian and horticulturist, saw them, later naming the plant “Poinsettia” after his friend. It was not until the early 1900's when the Paul Ecke family of Southern California began growing poinsettias for use as landscape plants and as cut flowers, did the public begin to take notice. Recognizing that they only bloomed in late-fall season and the colors accented the red and green associated with Christmas, poinsettias became an American tradition. Today, the Ecke family grows 80 percent of the poinsettias sold, which are priced according to the number of blooms (the more blooms, the more expensive). In nature, this perennial shrub can grow up to ten feet tall and the red, white, and pink colors many believe are flowers, are actually leaves. There are over 100 varieties of this non-poisonous shrub, making it safe to have around kids and house pets. In Mexico, December 12 of each year is known as El Dia de la Virgen de Guadalupe (Day of the Virgin of Guadalupe), a day commonly celebrated with red roses. But in the U.S. it is known as National Poinsettia Day, where the over $220 million dollar business takes hold for an average of six weeks. 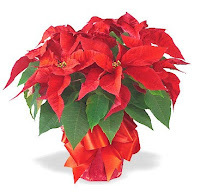 Red Poinsettias are favored by 74 percent of Americans, followed by white (8 percent) and pink (6 percent). Women 40 and older are the most common purchasers of the plant (80 percent). Not to be out done, the NCCA has an annual Bowl game in San Diego named…the Poinsettia Bowl. Happy Holidays!!! Yesterday at Home Depot, I witnessed a young American couple purchase 100 “Cuetlaxochitl”'s. Ironically, I was wondering where these beautiful plants derived from.